Ok, number one : I know of about 25 people working for big companies, some smaller, the get a prescription for suboxone every month. A few of my friends just went through their DOT drug tests while taking their suboxone and nothing ever came up. Why? Go read for yourself what the DOT tests for. It’s a 7 panel test. Suboxone has to be tested for specificly. Now that that’s out of the way, I don’t take it anymore. I quit July 3, the day I got my CDL because I didn’t want to be on the road taking meds like that. I do not want to be putting lives at risk. So there was nothing to hide. I’m currently looking for a LabCorp or equivalent here close to home to ha e a hair follicle test done for the last 4-6 months. More than enough to cover my refusal. Secondly, my original story probably did sound sketchy because I was panicking. I gave up my job, my home and spent all the money I had to go through CDL school. I had plans on trying to start my own small company in a few years. I don’t have children yet, but when I do I want to be sure they never want for anything because I grew up with nothing. So, when you give up everything to chase a dream and then your put in a place like I was, the only thing you’re thinking is “I’m jobless, homeless and all this was for nothing”. It’s a terrifying experience. As far as a second U/A, I agreed to it, they wouldn’t allow it. I asked and they refused. Which, according to DOT regulations, they are allowed to do. I’ve done my homework for the last two weeks and uncovered a lot. I’ve talked with several smaller companies and other drivers and from what I can gather, things like this happen more often than you would think. With that being said, regardless of what you think, unless you were there you don’t know what happened. I can tell you that I almost gave up, but that’s not my character. Should anyone have any helpful tips or ideas I am open to hearing. If all you want to do is belittle me, save it. I understand that they’re are plenty of guys out there that are trying to beat the system but I’m not one. I quit the medication to follow a dream and I’ll be dammed if anything will stop me. Yes, I’ve made some bad decisions in my life, those are mine to live with. My plan is to provide jobs for people coming out of prisons and rehabs l, because believe it or not, they are people too. There’s already a company in Ohio that has a CDL school in a prison and are hiring inmates as soon as they make parole. The world is changing quickly. Had I thought I would pee dirty, I wouldn’t have agreed to a second test. Yes, I did ask about the suboxone and was told, on this forum, that I needed to get past that before I jumped into this field. I did that. I got off the medication and do not doubt that all of you, and that company, see people trying to cheat on drug tests regularly, I have taken complete ownership of the mistakes I’ve made in my life. I take my career and life seriously. I’m sorry if I have said anything to offend any of you, that was never my intent. I have had a couple companies say that they are willing to give me a second chance, and say that these things happen regularly. Again, Im not ignorant that 99% of the time the person is guilty as sin. Thank you for your help. I have just gotten my CDL in July 2018 and went to orientation at a large company 8/13/18. I went in to take my urinalysis and gave the sample o the nurse, long to short, she took me to the safety guys office and said I had a “cold sample”. I wanted to either pour that sample in a different cup or retest and was told that if I would admit to falsifying the test and be willing to be strip searched I could be retested. So, I agreed. I got taken to the bathroom and then right back to the office without a search of any kind and told they would be reporting my refusal to take a urinalysis and asked to leave. I have literally sunk everything I have into becoming a truck driver and nownit seems like I’m screwed. What can I do? Hey guys, I’m Chris. I’ll be starting with PTL in about 3 weeks. I’m a greenhorn, just got my CDL and am looking forward to joining the ranks with all of you. My question is this, I have lower back pain and wonder if any of you have any advice on how to deal with it OTR? And coffee pots. I’ve also been reading all over this site about the sleep pattern of the OTRs and wonder if there is a way to keep a working coffee pot in my truck so that when I have the 4 hour waits for loading/unloading or 4 hours of actual sleep time and I’m not able to wake up in a Pilot parking lot, I have some good strong coffee. Are all companies moving the ward inward facing in cab cameras? I don’t know how much you know about this particular medication, but the medication doesn’t produce any effects when taken correctly. It is possible to over take it and get “high” but if someone is doing that they are defeating the purpose of the medication. As far as what I’m able to operate while taking it, I successfully operate cranes, large forklifts, platform and scissor lifts while taking this medication. But, I have talked to my dr and we have determined that, since I only take 1/4 of my prescribed amount each day, I can quit taking it altogether, which is what I’ve decided to do. 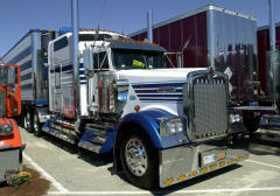 I’m really looking forward to this industry and eventually starting my own trucking company. Considering it's for narcotic addition... I'm not to sure I'd want to be near you driving a prius let alone a big truck. Get things sorted out first. I take a medicine called suboxone. Will trucking companies and DOT allow this medicine to be taken, it’s prescribed by a Dr.
Hey, I’m Chris. I’m in CDL school. I’m really looking forward to trucking but I’m a felon. Swift and a few others told me that my felony needs to be 7 yrs old and it’s ~ 4 yrs old. Can anyone direct me to a list of trucking companies that hire felons?